Various plant polyphenols have been recognized as redox active molecules. This review discusses some aspects of polyphenols’ modes of redox action, corresponding structure-activity relationships and their potential to be applied as adjuvants to conventional cytostatic drugs. Polyphenols’ antioxidative capacity has been discussed as the basis for targeting oxidative stress and, consequently, for their chemopreventive and anti-inflammatory activities, which may alleviate side-effects on normal cells arising from oxidative stress caused by cytostatics. Some polyphenols may scavenge various free radicals directly, and some of them are found to suppress free radical production through inhibiting NADPH oxidases and xanthine oxidase. Additionally, polyphenols may increase antioxidative defense in normal cells by increasing the activity of NRF2, transcription factor for many protective proteins. 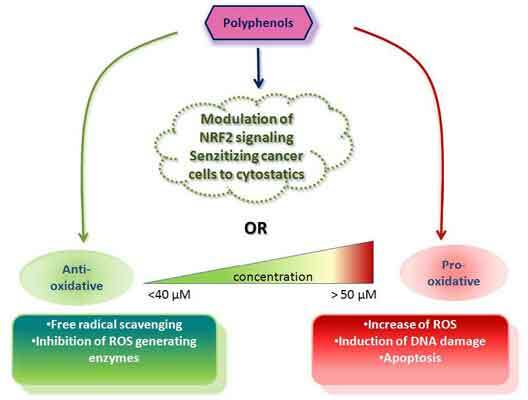 The activation of the NRF2-mediated signaling pathways in cancer cells results in chemoresistance. Luteolin, apigenin and chrysin reduce NRF2 expression and increase the chemosensitivity of cancer cells to cytostatic drugs. Their common 5,7-dihydroxy-4H-chromen-4-one moiety, may represent a starting pharmacophore model for designing novel, non-toxic compounds for overcoming chemoresistance. However, prooxidative activity of some polyphenols (quercetin, EGCG) may also provide a basis for their use as chemotherapeutic adjuvants since they may enhance cytotoxic effects of cytostatics selectively on cancer cells. However, considerable caution is needed in applying polyphenols to anticancer therapy, since their effects greatly depend on the applied dose, the cell type, exposure time and environmental conditions. Adjuvant, Anticancer therapy, Antioxidative, Curcumin, EGCG, Flavonoids, NRF2, Polyphenols, Pro-oxidative. Ruder Boskovic Institute, Bijenicka 54, 10000 Zagreb, Croatia.